An Israeli search and rescue party is set to leave Thursday evening for the storm-stricken Philippines in order to assist with post-flood efforts following Typhoon Ketsana, which claimed the lives of 280 of the country's citizens last week before moving on to Vietnam and Cambodia. The Israeli party, which belongs to F.I.R.S.T, is composed of volunteers from different search and rescue units. Yoav Zimran, the party's leader, told Ynet that preliminary efforts would include himself and five other volunteering doctors, nurses, and paramedics who will spend two weeks in the country. "In addition we are organizing a delegation of 10 other volunteers who will join us if necessary," he said, adding that the team was being funded by IsraAID. Vardit Aloni, a member of the second party, told Ynet, "Yesterday I was approached and told that a rescue party was heading to the Philippines. I agreed to join right away." This will not be Aloni's first time on an overseas rescue mission. In 1999 she was sent to Turkey to aid in post-earthquake rescue efforts, and two years ago she took part in a party sent to Peru after it was hit by a quake that killed hundreds of people. She says rescue efforts differed according to each country's needs. "In Turkey, for example, we arrived on the scene first and helped rescue injured people, and only afterwards we established a field hospital to work from. In Peru, on the other hand, the Jewish community provided us with a vehicle, a driver, and medical equipment, so we drove from village to village and provided aid," Aloni said. "In the Philippines we will also adapt ourselves to the field," she added. Doctors, nurses, and paramedics are also set to take part in Aloni's party. IsraAID stated that "the relief mission is a joint Israeli - Jewish effort with partners ranging from groups such as: The American Jewish Committee, B'nai Brith International, The American Jewish Joint Distribution Committee, UJA Federation of Greater Toronto and the Jewish Federation of Los Angeles all of whom support the team's efforts". 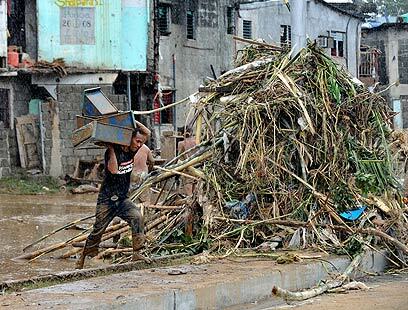 See all talkbacks "Israel to aid Philippines in post-storm efforts"